I was raised with the Revolution around me. I was born in Schenectady, NY—the frontier during the Revolution. In school, we took field trips to places like the Saratoga battlefield and Fort Johnson. I watched "Johnny Tremain" and read Last of the Mohicans. We spent summers in Boston. My mom would drop me off on the Freedom Trail, where I'd wander the Old Granary Burying Ground and ponder the site of the Boston Massacre. When I went to the University of Massachusetts, there was revolution in the air: I lived in an experimental college, Project 10, and got my degree from the upstart School of Education, making up my own course of study, attending pass/no-credit classes, and getting one one-hundredth of a credit for every 10-minute learning experience. I even took a class with Susan from Sesame Street. It's hard to explain today what was happening then, but, as my dean, Dwight W. Allen, said, "A little change hurts a lot; a lot of change doesn't hurt that much more." In 1973, I was one of the two student commencement speakers. I spent a decade as a journalist in Delaware, Massachusetts, New York, and Washington state, winning awards for consumer and investigative reporting. Later, I was campaign press secretary for the late Governor Booth Gardner, then public information officer for Group Health Cooperative, the Northwest's pre-eminent healthcare system (now part of Kaiser Permanente). I've continued to regularly freelance articles. My book, about the months after the British surrendered at Yorktown in 1781, came out in late 2015. In 2017, After Yorktown was named one of the best 100 books every written about the Revolution by the Journal of the American Revolution.. I've begun work on another book, a look at "fake history" and how it's affected public policy. Ted Kennedy and Esther Peterson giving me a National Press Club award for consumer journalism, 1978. I had hair then. 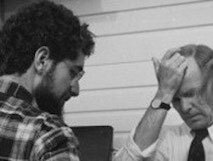 Soon-to-be Washington governor, Booth Gardner, 1984, in deep thought, and me. Booth's finest hours were in retirement when he campaigned successfully for a death-with-dignity law. He died in 2013. As 1973 UMass commencement speaker (2nd from left). Vernon Jordan (far left), UMass President and former HUD Sec. Bob Wood (speaking).